Here are the trends that emerged, along with their possible implications. At most institutions, the fundamental role of the branch network is to gather deposits, so deposit growth offers an apt starting point for discussing the current banking environment. From that perspective, last year’s data raise alarms. Across all U.S. bank and credit union branches, retail and small business deposits grew by 3.3 percent over the past year, the lowest growth rate since 2014. Overall deposits (the prior total plus corporate and public funds balances) grew by 4.0 percent, the lowest reading since the trough of the recession in 2010. 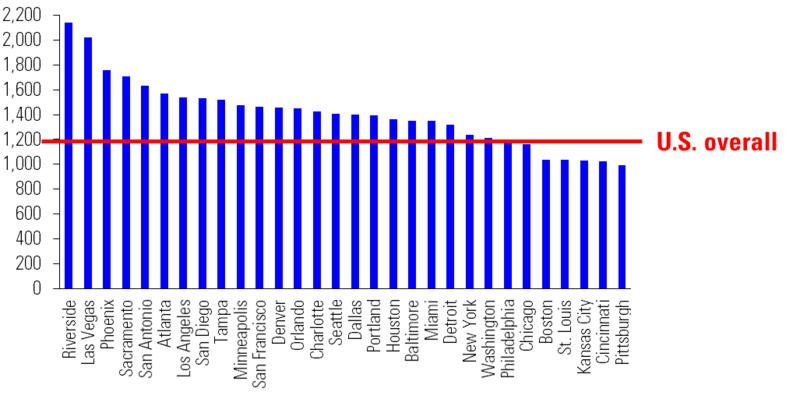 The lagging deposit growth rates may reflect competition from a robust stock market, fatigue at rates that—even after modest increases—remain near historic lows, unusually tepid real (versus nominal) wage growth given the low unemployment rate, and businesses drawing down cash supplies for investment during a strong economic period. But that favorable economic environment has boosted loan demand, too, rendering deposit growth imperative to maintain safe liquidity levels. One immediately apparent impact of the historic low-rate environment is evident in the erosion of CDs from consumer deposit portfolios. In 2000, CDs comprised 42 percent of U.S. consumer deposits and as recently as 2008 consumers held 38 percent of their bank deposits in CDs. But the recession ushered in a precipitous decline in CD preferences, and by 2016 consumers had reallocated their balance sheets such that only 14 percent of their deposits were in CDs. The trend away from CDs finally reversed in 2017, inching upward to 15 percent that year and 16 percent in 2018—suggesting bankers may need to start paying greater attention to their competitive positioning for that product type than in recent years. The trend of lower deposit growth occurred across the nation, with 26 of the 30 largest metros showing lower deposit growth rates in 2018 than in 2017. Performance varied across markets, with Orlando, Atlanta and Washington DC posting deposit growth of more than 6 percent over the past year, even as growth lagged at 2 percent in St. Louis, New York and Philadelphia. That noted, at the individual market level anomalous events can skew a one-year total, leaving a longer-term view more indicative. Over the past four years, Orlando showed the top deposit growth among the large metro peer group (as it did in the last year), with its deposit base growing at a 7.3 percent compound annual rate from 2014 to 2018. But the next-ranking markets differed from the one-year result, as four West Coast metros—Seattle, Phoenix, Portland and Riverside—followed behind Orlando. Top 30 MSAs Although the Northeast corridor continues to host the greatest concentration of population in the U.S., Washington was the only metro in that region to rank above median in four-year deposit growth. Boston ranked slightly below median, while Baltimore, New York and Philadelphia all ranked among the bottom-ten markets in deposit growth—each with four-year deposit CAGRs in the 3.0-3.5 percent range. Credit unions showed stronger deposit growth than banks in recent years, increasing retail and small business deposits by 6 percent over the past year and at a 6.4 percent annual pace over the past four years. Among banks, large institutions—defined as those with assets greater than $100 billion—posted 4.3 percent annual deposit growth from 2014 to 2018. That compares to 3.7 percent for the less-than-$1 billion and $1 billion-$20 billion tiers, and 2.8 percent in the $20 billion-$100 billion tier. The lesser performance in that lattermost tier may reflect the challenges of competing in a middle ground, without the absolute scale, scope, and efficiencies of the national banks but also without the single-market focus of a community bank. Even as deposit growth waned, consumer loan demand continued to increase in the past year. Aggregate credit card balances reached a peak in 2008 and then declined sharply during the recessionary years, bottoming out from 2010 to 2011 before beginning a slow rebound. But in 2017 credit card balances surpassed the 2008 peak, and continued to rise, reaching record levels in 2018. Auto loans recovered more quickly, surpassing pre-recession levels in 2013 and rising each year thereafter—also reaching record levels in 2018. Offsetting that to some extent, home equity borrowing continued a pattern of erosion that started during the recession and has yet to abate. And aggregate home equity balances are less than half the level of 2008. The $600 billion decline in home equity borrowing more than offset the combined increase in credit card and equity borrowing, so non-mortgage consumer borrowing remains below pre-recession levels. However, an increase in mortgage loans in that period leaves aggregate consumer borrowing at an all-time high level. 2018 was the fifth consecutive year in which aggregate U.S. branch counts declined, and the eighth such year in the last nine (2013 showed a small increase in branch counts). Banks and credit unions combined to shed a net 1,700 branches over the past year, and 6,200 over the past four years. The four-year decline represents 6 percent contraction from 2014 levels, and the count of 105,000 branches nationwide sits 8 percent below the peak levels of 2010. As with deposit growth, the pace of branch contraction varied across markets. Branch counts have declined in every one of the top 30 metros over the past year, but the declines ranged from severe to minimal. The Baltimore metro saw a 10 percent reduction in its branch counts over the past four years, while Chicago, Washington, Atlanta, and Sacramento experienced declines in the 8-10 percent range. In contrast, Boston’s branch count declined by only 1 percent over the past four years, and San Diego, Charlotte and Seattle saw contractions of only 2 percent. Of the 107 metros with 500,000 or more residents, all but three host fewer branches today than in 2014 (the Spokane, Wash. market added a single branch in that timeframe, while counts in Bakersfield, Calif. and Lancaster, Pa. remained unchanged). The closures have yielded a less concentrated branching environment. Across the U.S., there is now one branch for every 1,180 households, compared to one for every 1,030 households four years ago. Branch concentration remains sharply higher in long-established Midwest and Northeast metros: Pittsburgh, Cincinnati, Kansas City, St. Louis, and Boston all contain one branch for every 1,000 households. 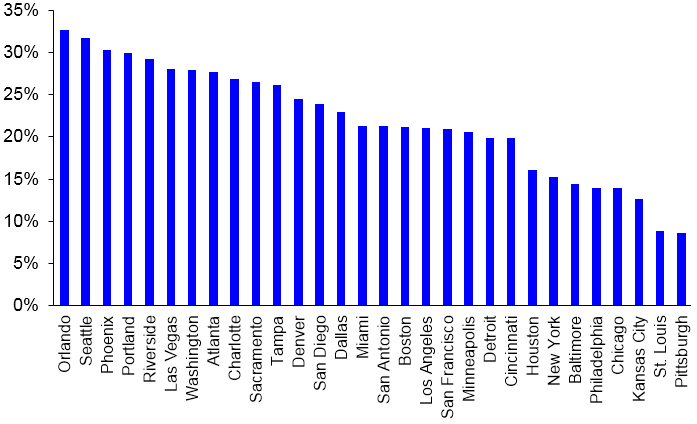 In contrast, the Riverside and Las Vegas metros each show ratios of more than 2,000 households per branch. And Phoenix, Sacramento, and San Antonio show ratios of about 1,600 households per branch. Branch Concentration Note though, the branch count statistics are net changes, and thus do not fully show the magnitude of branch closures—but also do not imply a cessation of new-branch development. Rather, the 1,700-branch decline in the past year represents the net impact of about 2,500 branch closures, offset by 800 new-branch openings. Each of the past four years have seen 800 to 1,000 new branches open nationwide. Although some banks undertook wholesale consolidations as either post-merger optimization exercises or as part of an institution-wide efficiency campaign, the last year’s closures occurred mostly in low-risk situations. In 25 percent of the closures, the institution maintained another branch within one mile of the closing office—and in 50 percent of closures there was a surviving branch within two miles. Further, the average deposits of branches closed within one mile of a surviving branch approached $38 million, the same level for branches within one to two miles of a surviving branch. But that average declines in lockstep with distance. For example, the branches closed within two to three miles of a surviving branch averaged $33 million in deposits; at four to five miles, $28 million. By 10 miles or more the deposit average is only $21 million. In sum, the farther removed from a surviving branch, the smaller the closed branches, as bankers understandably would risk only small deposit bases without a nearby option to ensure retention. An additional result of recent mergers and closures is an increase in the concentration of branch ownership. The 10 largest banks in the U.S. by branch count now own 33 percent of all branches nationwide, and the 50 largest own 52 percent of all branches. Just 250 banks combine to own nearly 70 percent of all U.S. branches, and in each tier, these concentration levels are about two percentage points higher than four years ago. The credit union side of the industry remains less concentrated, with the 10 largest credit unions (again, by branch count) accounting for 6 percent of U.S. credit union branches, the 50 largest holding 14 percent of branches, and the 250 largest holding 35 percent of branches. After years of deliberate balance sheet restraint and even contraction, many markets are seeing ample potential for growth in markets with robust commercial loan demand. However, harvesting that asset growth opportunity without unduly compromising margins will prove challenging if the low deposit growth of 2018 persists. Increasing competition for deposit dollars at a time when the overall deposit pool is expanding only modestly will heighten the importance of relationship-building skills to find and retain deposits, absent a default to price-based appeals that would threaten an institution’s margins. Keep in mind, the discipline of negotiating rates with consumers is wholly unfamiliar to a generation of branch managers who started their careers after 2008. This group has never worked in an environment where rates on any instrument were sufficiently above zero to allow for meaningful differences among competing institutions. The continuing shift in consumer borrowing preferences away from home equity lines and into instruments such as credit cards and auto loans presents challenges in that large banks, specialty lenders and captive finance companies hold outsize share in those markets. Traditional banks and credit unions, on the other hand, hold much greater share in the still-shrinking home equity market. With most institutions selling the majority of consumer mortgages forward and off of the balance sheet, those that wish to maintain a balanced consumer/commercial divide in their loan portfolios must consider changes such as new portfolio mortgage products, indirect lending, in-house credit cards or a premium home equity product that can capture significant share of a smaller market. Changes in consumer channel preferences have reduced in-branch transaction demand, allowing modest branch consolidations in recent years. However, a closer examination of recent branch closings confirms most are still targeting either overlapping branches or outlying offices carrying balances below profitability thresholds. They are not gambling on a proposition that consumers are willing to tolerate greatly reduced branch networks or substantially longer travel times to their offices. Accordingly, even as electronic channels demand a greater share of the delivery network budget, bankers must act judiciously when seeking to find those funds at the expense of the traditional branch network. Closures should occur only at those branches close enough to surviving offices to forestall significant attrition, or at branches already draining profitability. Any more aggressive actions would risk creating a competitive disadvantage relative to institutions maintaining broad market coverage.